AT a factory that specialises in the manufacture of glass lenses in Germany, Spring Singapore deputy chief executive Ted Tan's simple question - why don't you outsource this to Singapore? - was met with a surprising answer. The head of the family- run business or mittelstand - the German equivalent of a small and medium enterprise (SME) - had approached various companies in Singapore but found that the costs were too high. "It's quite surprising, right?" asked Mr Tan. "Then I realised that they have one operator looking after three very sophisticated machines. And because it's highly automated, they are highly productive because the machines run almost 24 hours. In Singapore, we probably have three persons operating one machine." 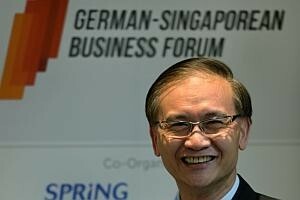 One of the key takeaways from years of collaborating with German companies for the German-Singaporean Business Forum (GSBF) is that the differentiating factor between mittelstand and Singapore SMEs is focus, said Mr Tan. "When you compare German and Singaporean companies, there are some differences in the way we operate. They are very focused on niche capabilities . . . and develop very deep capabilities within the company," he said. While local SMEs try to do everything, German companies are focused on deepening their competitive advantage in order to allow them to harness their full potential. This specialisation not only increases their productivity, it also means that they are the best at what they do. Spring Singapore has since been trotting out this message to Singapore SMEs. "So we challenge companies: are you really good at doing all these things? What are your main revenue contributors? Our job is to help them focus; out of these 10 things, it may actually be two or three things which contribute 80 per cent of the company's revenue," said Mr Tan. "SMEs are very small, so they don't have the depth of pocket or manpower to do a lot of things. So find your own unique selling proposition and focus on that," he said. It is also imperative that companies upgrade their capabilities and technology. This includes hiring people who are operationally suited for the job. "As we continue to build master craftsmen (polytechnic and ITE students) and deepen their expertise, I think companies must realise that (they should) pay for skills instead of paying for just paper qualifications," said Mr Tan. This same focus has been implemented in the way the GSBF is run. Since 2008, the forum has shifted away from its general focus to target three main sectors - medical technology, precision engineering, and clean technology - which were identified as sectors with strong growth potential for both Germany and Singapore. "It has resulted in a much more focused collaboration between Singaporean and German companies because then we have people from the same three sectors coming together over the last few years establishing potential collaboration platforms," said Mr Tan. A number of successful partnerships have since been forged. For instance, Environmental Dynamics International (EDI) Asia, which specialises in wastewater treatment, inked a partnership agreement with German company Biolak Technology to represent their biogas technology in South-east Asia. This strengthens EDI's product offering and at the same time enlarges Biolak's technology footprint in Asia. Similarly, Singaporean company T.Ware, which specialises in wearable technology, will start product trials for its T.Jacket, with two German autism centres. The T.Jacket is an app-controlled smart jacket that helps to calm a wearer and keeps the person focused by "hugging" them. Over 50 business leaders from 27 Singaporean SMEs attended the bi-annual GSBF in Germany this year. It is the largest delegation of SMEs ever sent, and they benefited from a series of company visits, business matching and networking seminars to enhance collaborations with German counterparts.